The Ski House Hideaway is a fully renovated 1 bedroom condo in Mt. Bachelor Village Resort. Located on the Westside of Bend, Oregon, and just 18 miles from Mt Bachelor Ski Area, the location is fantastic. You can walk to the shops and restaurants on Century Drive, or an easy bike ride will take you to downtown Bend where there are plenty of shops, restaurants, breweries, and much more to discover. The Old Mill Shopping District is also a quick bike ride away. There is exceptional mountain biking right off of Century Drive accessed by a trail just behind the condo. With the spectacular Cascade Lakes and miles and miles of wilderness just outside of your door, the Ski House Hideaway is the perfect launch pad for your Bend, Oregon adventures! The resort features a community pool (seasonal) and hot tub, and a playground for kids. River trail access is just outside the door with 18 miles of the beautiful Deschutes River for you to explore. The condo has been fully renovated and beautifully updated with stainless steel appliances, tile finishes, and upscale furnishings. The kitchen is fully equipped with everything you need to make a family dinner, or to grab a quick snack. There is a sit-down counter with 4 comfy bar stools. Relax on the comfy couch and watch a movie on the Smart HDTV accessing your own Netflix account. Or, unwind with a book by the fire with views of the pine trees just beyond the balcony. There is a queen bed with a new, high quality mattress and European style bedding including high thread count linens, and a down duvet. The sleeper sofa has an upscale memory foam mattress and linens are also provided for your extra guests. There is a coin-operated laundry facility on the premises, free high-speed wireless internet, games, books, and much more for you to discover! My husband and I had a wonderful stay at this condo for a kid-free long weekend get-away to snowboard at Mt. Bachelor. We were impressed with the well-stocked kitchen, making it easy to cook breakfast and a dinner meal. The bed was very comfortable and we slept well. The place was newly remodeled, nicely decorated and very clean. I also loved it was just across the street from the hot tub. We will gladly return! Cute and cozy 1 bedroom condo. We visit Bend frequently and this place was perfect for a winter hideaway. Just the right size for 2 and the place has recently been redone to update it. The kitchen is quite well stocked with just about all you need for cooking as far as utensils and equipment. Nice view-we were there in the snow so it was very pretty. It was very quiet to. We did not get to use the hot tub due to the weather but it is a nice tub and pool area. We would use this hidaway again. Thanks Bluebird! We made a last minute reservation and the info to check in was e-mailed to us. Getting in was fast and easy. Place was small but had everything we needed. The location was excellent for our needs and there was a great trail nearby along the river for those early morning and evening walks. Nice accommodations, great location! We booked last minute without a problem with the instant booking feature. 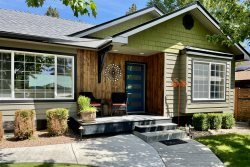 This little condo was a wonderful way to experience Bend! It was a short drive to Old Mill or downtown and the area was quiet and peaceful. Pros: beautiful surroundings and quiet, fully stocked kitchen and bathroom (never ran out of towels or basics like toilet paper), bed was very comfy and linens were soft and plush. Condo was very clean also and close to playground and pool. Great for our small family! Cons: almost none! Couldnt find the tv instructions right away and had a toddler that was very tired and wanted to watch cartoons so a dvd player wouldve been awesome. Definitely would stay here again! We really enjoyed staying in this 1 bedroom condo at Mt. Bachelor Village. Easy location to town and lots of great breweries, only about a 1/2 hour to the ski resort and our favorite part is the path down to the river for a nice walk. The weather was cold & still rainy so we didnt take advantage of the pool, but it was right across the parking lot. Mt. Bachelor Village is a great location and we would like to visit again. This was a wonderful location and the best unit I have stayed in to date. The Host (Bluebird Day) Rebecca communicated regularly, checked in on me when I had settled in, and did a good job trying to resolve a minor issue that materialized. This remodeled unit is comfortable, has all the amenities of home, and was super clean inside. I will use this unit in the future. We had a great time in bend! The hosts were really great at having recommendations on where to eat and stuff to do. The condo was quiet, clean, and nicely laid out very comfortable for us as a couple to enjoy our time there. The kitchen had all necessities that you would hope for including a nice coffee sample from Backporch coffee for the morning. We will definitely consider this property for our next visit to Bend. This was a great Ski Hideaway, just 20-30 minutes from Mt. Bachelor Ski Resort. This 1 bedroom apartment is definitely roomy enough for 4 people, although there were just 3 of us. The bed was super comfy, with great linens and pillows. The kitchen was stocked with nice cookware, utensils, plates, etc. You couldnt be any closer to the hot tub than this unit on the property. It is literally right across the parking lot driveway. Also, the owner/rep checked in with us via email to see how our stay was. Great!! We loved this condo. It is close to town yet in a wooded setting. The resort has a pool and hot tub, both of which were well maintained and not very busy. There are many attractions nearby (i.e. Newberry Volcanic Monument, Lava Cave, Deschutes National Forest and the city park along the Deschutes River). There is no air conditioning and even though it was in the 80s while we were there, the condo stayed cool.